Throughout neighborhoods in the Midwest, residential lots follow a common pattern. Front yards, usually with a lush sweep of lawn, are open to sidewalks, passersby, and the street. Backyards are more private, perhaps even fenced or bordered with trees so families can relax, play, garden, grill, dine, and entertain with a sense of privacy. For a family in Eden Prairie, the reverse was true. 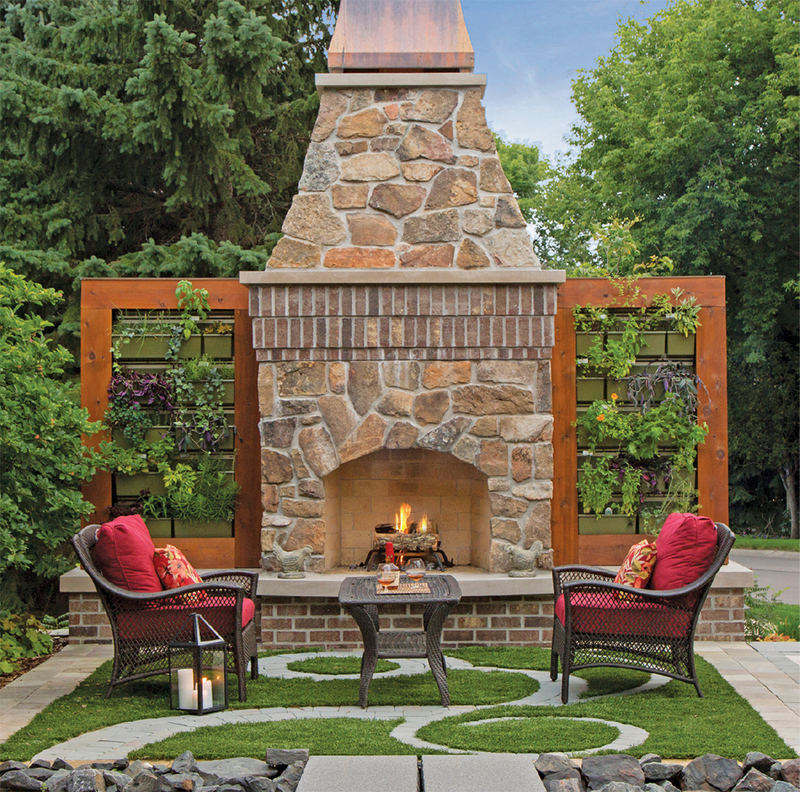 Their small backyard was so exposed to adjacent houses that “it felt like a fish bowl,” says Becca Bastyr, senior designer, Mom’s Design Build in Shakopee. Conversely, the 2,500-square-foot front yard “had far more opportunities for amenities and privacy,” she adds. A ring of spruce trees already blocked the road, and about 15 years ago, the team at Mom’s installed a pond and front patio. 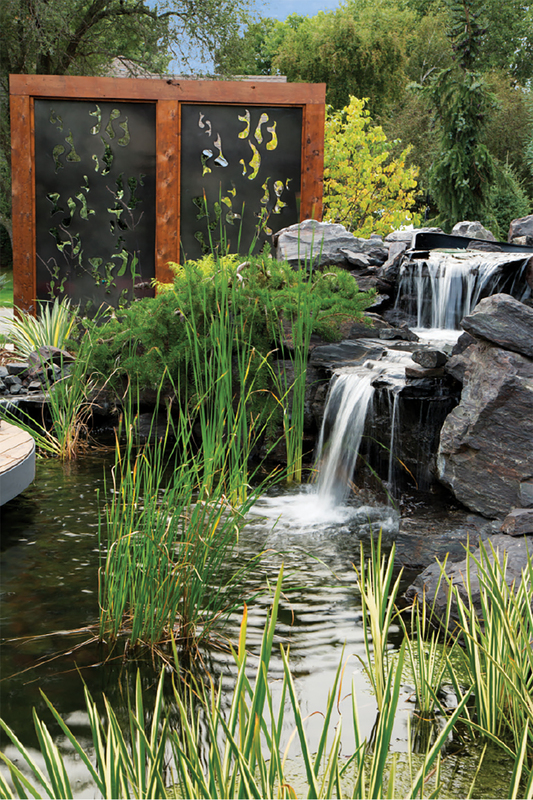 Because the family traveled frequently to Bali and loved the culture and architecture, the team then designed a Balinese-inspired outdoor platform over the pond for yoga, meditation, and relaxing in the front garden. The homeowners were so pleased, they remodeled their home so the kitchen is at the front of the house overlooking the pond and front yard. 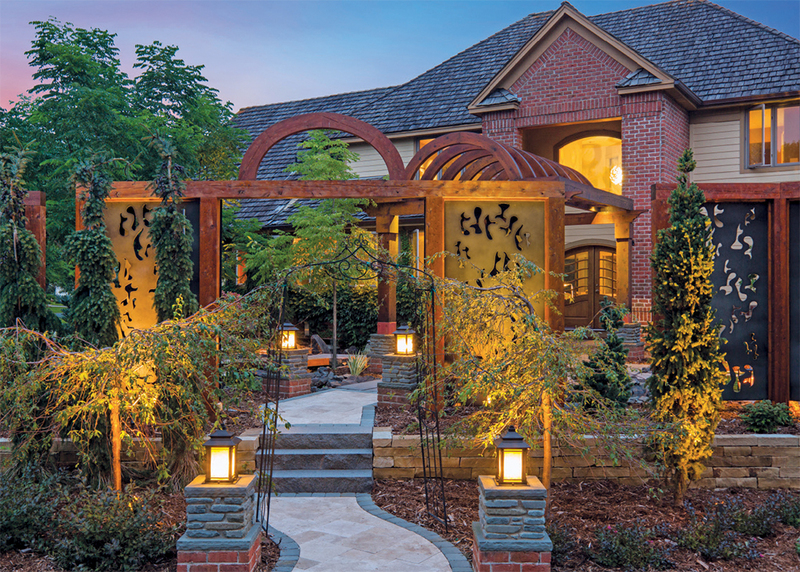 “The nature of the entire home and how they lived were transformed by these simple, yet serene additions to the front,” says Jim Sweeney, Mom’s founder. When the spruces along the road began to fail, the landscaping team treated the trees. But two years ago, they had to come down. In their place went up a series of timber-framed aluminum art panels from Parasoleil, which were also used as a sliding gate beneath an arch at the entrance. To convince the city the panels were not a front-yard fence, which is subject to height restrictions, the team stressed their aesthetic qualities. The black panels filter and modulate light as it enters the front yard, and the homeowner selected their laser-cut pattern because it reminded her of the jellyfish she admired while visiting an aquarium in Vancouver. During this phase of the project, the team also reduced the size of the pond to install a sitting area with a jellyfish pattern of stone and synthetic turf underfoot. A masonry fireplace is flanked by double-sided timber and metal trellises with planter boxes, which form a living wall of herbs and vegetables. 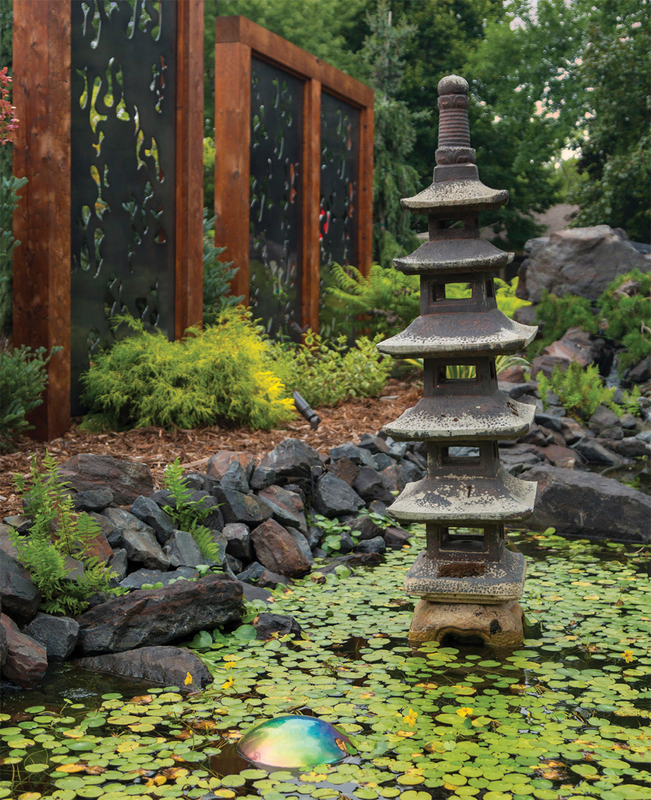 Modern Asian-style lanterns and statues imported from Bali were installed. The new mix of vegetation includes Serbian spruce, Horstmann’s Silberlocke Korean fir, hillside creeper pine, and Fritsche spruce; ‘Dark Horse’ Weigela and ‘Caramel’ Heuchera; Louisa crabapple and hydrangea trees; and ‘Tiger Eyes’ sumac and Japanese lilac. 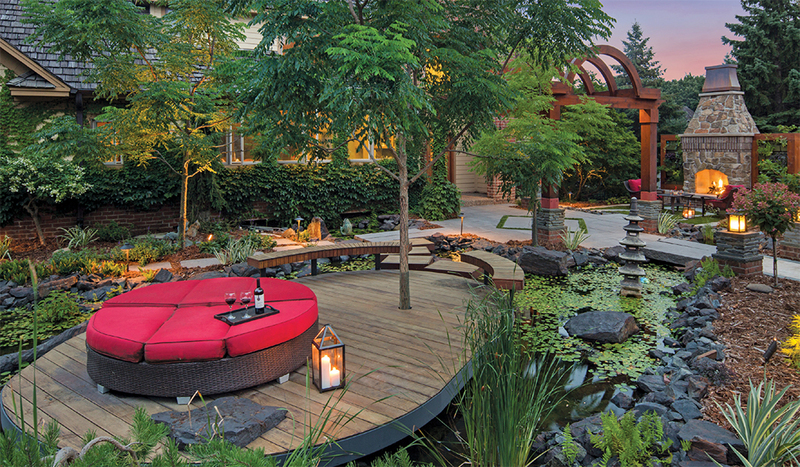 Now that the kids are grown and gone, the homeowner drinks her morning coffee in the garden, does yoga on the platform, and entertains family and friends around the fire and beneath the pergola next to the pond. “She lives out there in the summer,” Sweeney says.